A willow dragon has been built at Doddington Hall ready for the biennial sculpture exhibition which opens at the end of this month. Children and adults will be able enter the dragon’s belly; children can crawl through its tail as well as walk under its wings and look up to see its blazing orange eyes… It is situated in front of the Gatehouse at Doddington Hall, and has been created by willow sculptor Carole Beavis. Whilst the exhibition is open, from 30 July to 11 September, visitors will be asked to tie a piece of fabric to the dragon’s wings, adding colour and texture, as if skin, scales or even fire! It is hoped that this sculpture (which will not be for sale) will help visitors gain a fresh perspective of the creative process plus adding textiles will be a tactile experience, inspiring visitors of all ages to consider creating art themselves. The funding to carry out this project has been awarded by the Lincoln Cultural and Arts Partnership (LCAP) through the Cultural Destinations fund which is supported by the National Lottery through Arts Council England and Visit England. The Cultural Destinations project aims to bring together the cultural and visitor economy sectors to support economic growth. 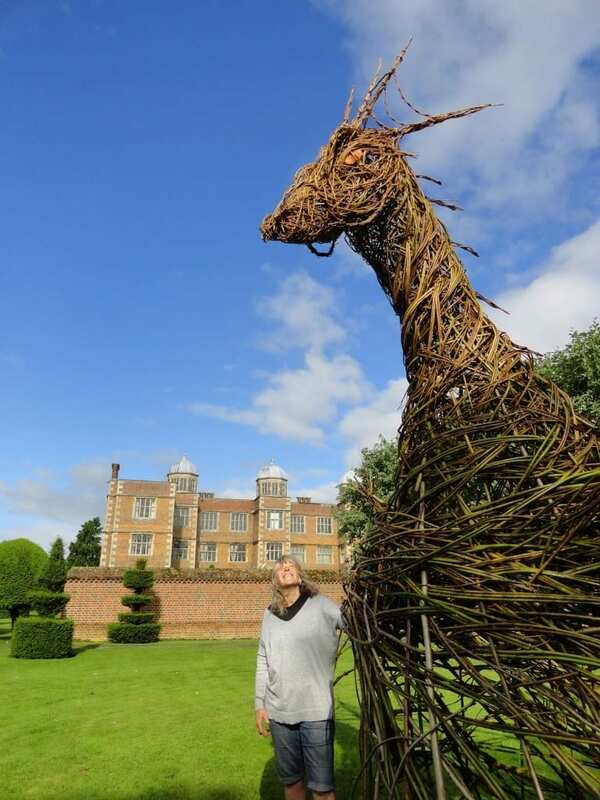 The Cultural Destinations fund recognised the importance of Doddington Hall’s biennial sculpture exhibition, and approved the project due to the interactive element of the willow sculpture. It is felt that the opportunity for visitors to add to an exhibit would strengthen the appeal of visiting both the city and the exhibition. The biennial sculpture exhibition has become a popular fixture on Lincolnshire’s summer event calendar and appeals to all age groups. ”It’s a chance to enjoy one of the largest exhibitions in the country of outdoor art,” explains Claire Birch, who runs the Estate alongside her husband James. “We are delighted to be able to offer a piece which will change appearance daily and represent the visitors who came and shared the event with us.” Work by over 75 leading national and international sculptors will be featured with 450 original and inspirational pieces which will be displayed in the Elizabethan property’s grounds as well as a smaller number indoors. The exhibition will be open every day from Saturday 30 July to Sunday 11 September and is included in the cost of garden admission. A full colour exhibition catalogue and guide will be available; all pieces will be for sale (except thedragon). For more details www.doddingtonhall.com or call 01522 694 308.